Are you into freezer meals? Maybe you’ve seen that pin on Pinterest about how to make 30 meals in 30 minutes for $30 (or something only slightly less crazy sounding)? This is not that post – but I do think freezer meals are wonderful, delicious presents you give your future self. Future Self, you seem stressed. You look like you’re about to roll up to the drive-thru (again) or feed everyone pinto beans + croutons + raisins, aka the pitiful contents of your pantry. Here: this is an Actual Meal you can have instead. I don’t mind a thrown-together dinner every so often, and I really, really like takeout…but I don’t like to eat that way for days on end. Eating a real meal with my family is something I love, and stocking my freezer helps me have that luxury even during crazy, busy seasons! Examples of such seasons – school starting up and the transition to a new schedule that involves homework and evening commitments. Your people have sports and after-school activities and you’re driving all over the place instead of fixing dinner. You’re getting ready to move (I totally wish I had done this before our move last year!). You’re heading into the holidays and there are so many extra things to do. You have a cyclical busy season with your job, like tax season for accountants. You’re having a baby (this is the scenario that prompted my most recent stashing efforts). I know a few real-life people who get together to do a marathon cooking day to pack their freezer with meals, but it’s not a rhythm I’ve been able to get into. (I tried a mini-marathon once and even that made me cranky – too many dishes, too much standing, not enough instant gratification.) I like to spread out my efforts with a more gradual approach – making double batches of meals we like and freezing the extra. I do this sometimes anyway, but I aim for 2-3 times a week over 6 weeks if I need a super-stocked freezer. This is how I do it! Step 1: Make room in your freezer. Use previously stashed freezer meals if they’ve already been around for awhile (I choose not to define “how old is too old” for freezer meals, but I’ve found some OLD STUFF in my freezer from time to time). Use frozen meats (I don’t recommend using previously frozen meat in freezer meals), both those half-empty bags of peas, and anything else that you don’t want to bury behind all your shiny new meals. Step 2: Start your Freezer Inventory List. While you’re digging around in there, make a list of what you have! I have a magnetic pad on the side of my fridge and try to remember to cross things off as I use them, and add to the list whenever I put something in the freezer. It helps me with meal planning, and I’m less likely to let things get lost (and eventually wasted). Step 3: Stock up on freezer bags, foil pans, etc. Step 4: Make a goal list of what you’d like to end up with in your freezer. Think about how many meals you’d like, if you want breakfast or snack options as well as dinners, etc. I highly recommend freezing meals you already know you like (i.e., don’t make the 30 meals in 30 minutes recipes unless you already know you like them). You don’t need your freezer’s help to make a crappy meal on a busy night. The point is to have a great meal on a busy night! For lots of freezable meals, see the links below. Step 5: Plan to make a double batch of something on the list for a regular meal. It’s extra effort, especially if your recipe involves a lot of chopping, but not double the effort, since you already have the ingredients out and you don’t have to wash the dishes twice. And the good news is you’re also making dinner for tonight. Step 6: Do the math and write out a doubled version of the recipe before you start cooking. Step 7: Label the heck out of your extra meal and add it to the Inventory List. You might think you’ll remember what’s in that bag, but once it gets a little freezer-frosty it’s pretty hard to tell the difference between spaghetti sauce, taco meat, and chili. Avoid mystery meals! ;o) If you really love yourself, you’ll include reheating/cooking instructions on your label. Step 8: Chill the freezer meal in the fridge, then freeze. Don’t put hot food in the freezer. You already knew that, right? Step 9: Repeat steps 5-8 until your list is complete! I think starting 6 weeks before you need the meals gives you just the right amount of time to do the double-batch-and-stash 2-3 times a week and end up with an awesomely stocked freezer (you can obviously accelerate the process, though). Before baby #3 came I only finished half my ambitious list, but I still had 7 dinners and a bunch of muffins and breakfast cookies in the freezer, which is way better than nothin’! Step 10: Use your meals! I’m a recovering freezer meal hoarder – don’t be like me! Use your investment of time and ingredients to have a stress-free good meal on a busy day. Carnitas – If you haven’t made this yet, DO IT! Detailed freezing and reheating recipes included with the recipe. Nana’s Spaghetti Sauce – Perfect for pasta or Italian Zucchini Boats. 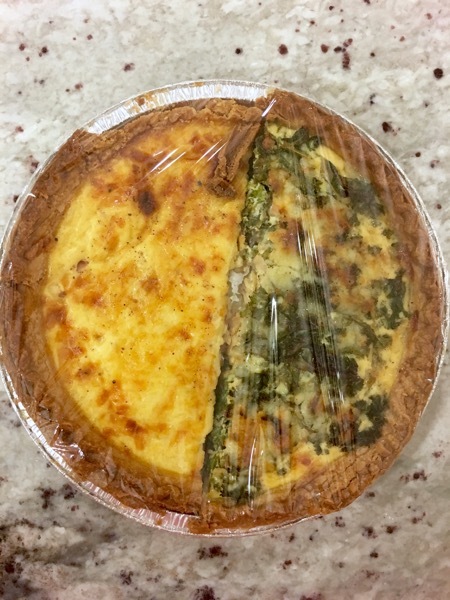 Easy Cheesy Quiche – I froze the baked quiche in individually wrapped sections – not sure what the best reheating method will be, since I haven’t used them yet! Giada’s Meatball Stew – So hearty and delicious. Veggie-Packed Baked Burritos – Good for dinner, but make a happy lunch, too. 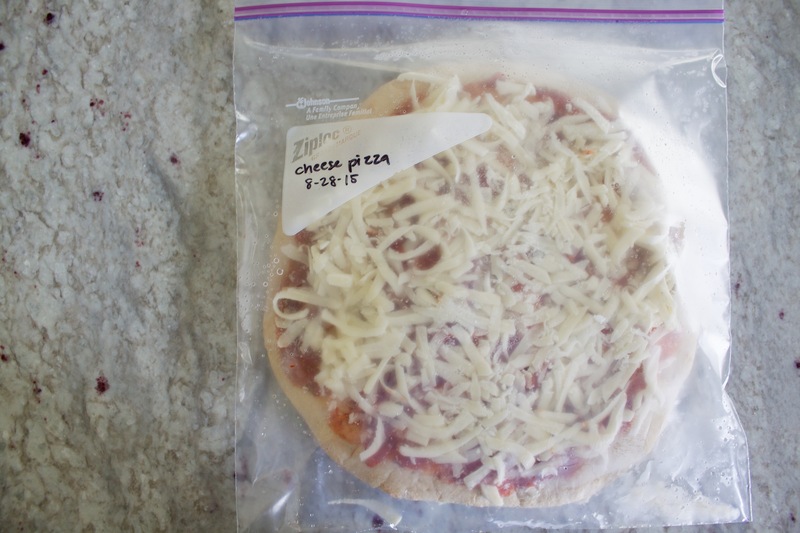 Homemade Frozen Pizzas – Pretty sure my family wishes I would concentrate all my freezer-meal-making energy on pizzas. 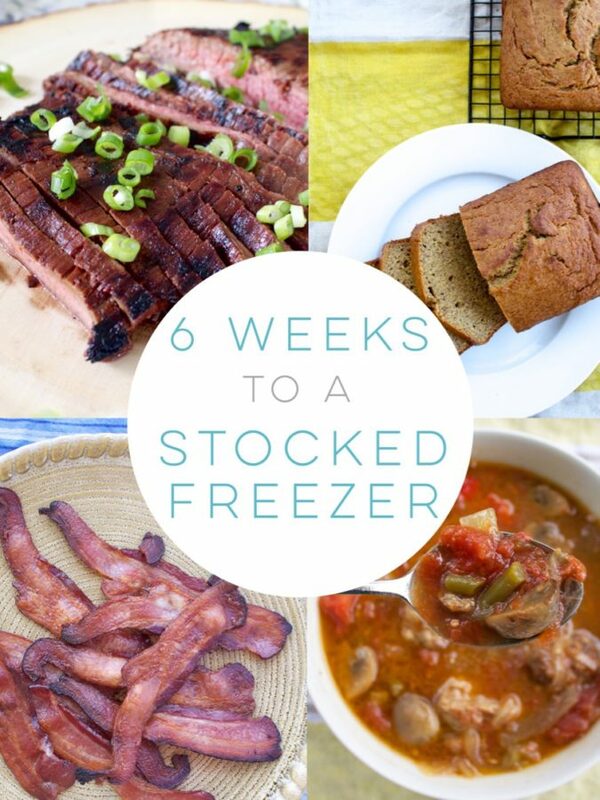 Make sure you have room in your freezer for the flash-freezing step! 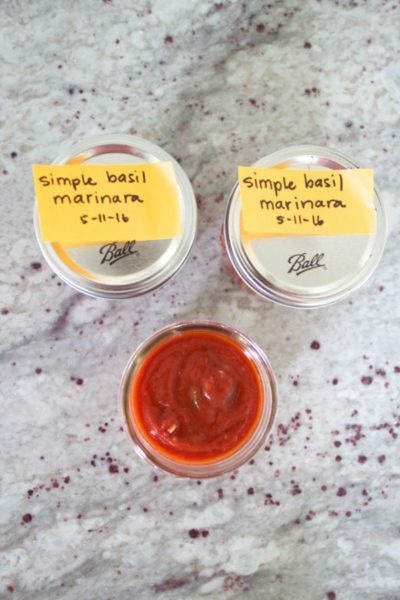 Simple Basil Marinara – It’s so good, and only takes 20 minutes to make. Stock up! Five-Minute Basil Pesto – Preserve those summer flavors, baby! Plus: so many ways to use it. Shredded Chicken & Stock – More of a meal kit for a future soup or casserole. Glenn’s Chili – Just add chips and cheese. Cheesy Bean Burritos – Another easy lunch or dinner! Creamy Chicken Tetrazzini – I freeze this unbaked since all the ingredients are cooked, then thaw and bake. Shepherd’s Pie – I double the meat/veggie mixture and freeze that in a bag in a pan, so it freezes in a pan shape – then you can let it thaw right in the dish you’ll use to bake it! I recommend making fresh mashed potatoes the day you want to serve it. Crockpot Chicken Tortilla Soup – You can freeze the soup, or just the shredded chicken to use for tacos. Soy Sauce & Honey Marinated Flank Steak – Freeze the raw steak in the marinade so it marinates while it’s thawing. Taco Meat – How to make faster-than-fast-food even faster: freeze some for later! Bacon in the Oven – You can reheat it in the oven or toaster oven for a quick baked potato or soup topping, grilled cheese, or a breakfast side. Chocolate Chip Granola Bars – A perfect, health(-ier) solution to a cookie craving. Bran Muffins – I love these for breakfast or a hearty snack. Whole Wheat Banana Bread – I cut a loaf in half and wrap each half individually so I can thaw a chunk for a quick breakfast. Applesauce – Fair warning: you’re not going to want store-bought applesauce anymore! I love this post from How Sweet Eats: that one time that I made ten million freezer meals. Required reading before embarking on a freezer meal project: Tips for Freezer Cooking from Life as a Mom. Great tips and meals from The Pioneer Woman. 8 Essential Types of Freezer Meals from The Kitchn. I love Mel’s Kitchen Cafe – these are her freezable recipes. What are your favorite freezer meals? Holler at me in the comments! 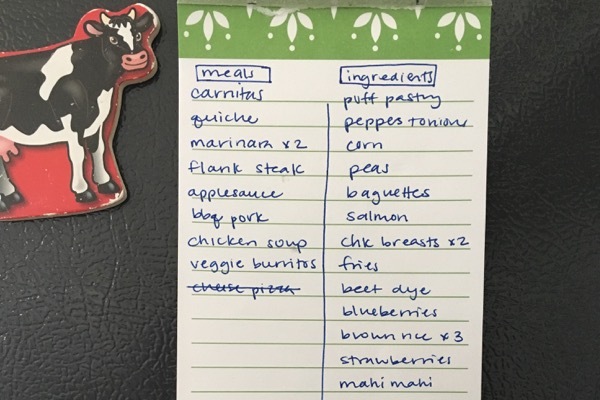 21 Day Fix Mini Meal Plan - Free! This is SUCH a great post!!!!!!! This will be implemented in the Britt house stat. Thanks!! It’s so worth it – especially with the schedule y’all have!! I’m overwhelmed by the planning of it all, but I love the idea and hope that I can pull my act together. Kara, you can totally do it!! Jay has been quoting this to me lately: a good plan is better than a perfect plan. Even if you just do a couple it’s worth it!! ???????????????? I’m with you on taking my time to freezer cook. I’ve been slowly stocking my freezer over the last month in preparation of baby number 3. It feels SO GOOD to have some healthy options stored away for the upcoming busy season in my life! I too double and freeze a meal at a time, because I hate the giant cooking day required to stock a month’s worth at once. Going to try out some of these recipes to add to the rotation! Oh, wonderful! Let me know if you find some keepers! ??? ?